I’ll admit, before deciding to research for this article, I never really gave the Smoothie Store in the Bazaar of Neopia Central a chance. There were always so many other stores available, and something about the “health” factor of smoothies really put me off. I mean, why not get a bubble tea from The Coffee Cave in Roo Island or a slushie from the Slushie Shop in Terror Island? Sure, the boba was loaded with sugar. And sure, the trip to the Slushie Shop was long, inconvenient, and cold, but the icy drinks were always sweet, flavored with delicious syrups. But surely that was much better than drinking some...blended up broccoli and spinach or something. But finally, one day, I decided to see what was really in the Smoothie Store. Before, I always saw a few regular customers coming in and out of the establishment, happy, with colorful smoothies to enjoy. I mean, I even saw the generous Soup Faerie come out of the store before, happy and energized. Surely that was a good sign. Maybe I should actually start living and eating more healthily. And visiting this store for the first time was going to be the beginning of it. As I approached the storefront and went in with my Gelert, we were both impressed by how new the whole building looked. The design was modern. There were plenty of windows that allowed sun in, giving the place a great energy. Behind the counter, the fit red Tuskaninny owner took the time to greet us, before getting back to operating a blender. The place overall had a pretty friendly atmosphere to it, and it wasn’t too packed when we got there on a weekday afternoon. But let’s get back to what I’m sure you’ve been reading this article for: What smoothies do they really offer, and how do they really taste? Well, when I first saw all the smoothies they had to offer, I was overwhelmed, as well as impressed that the Tuskaninny had the time to stock them all. There were really strange smoothies, like the fishy smoothies, which honestly grossed me out. For this article, I decided I would just try some of the more conventional, vegetable and fruit based flavors, and leave the rest to a potential sequel. I couldn’t try them all, but I noticed so many different flavors I had never heard of or thought of combining, like the vegetable ones, including spirulina smoothies (a type of seaweed), asparrot smoothies (asparagus and carrot), and kalery smoothies (kale and celery). The ones with fruits, like the wheatgrass fruit smoothies, islandberry smoothies, or blueberry tomato blend smoothies, seemed more tasty. I bought a couple of vegetable based drinks and fruit based drinks to review. I wanted the first smoothie I tried to...be at least somewhat appealing, so this seemed like a tasty choice, with its eye-catching name and color. The description proclaims this is pomegranate-berry. When I drank it, I definitely tasted the pomegranate, but struggled to make out what exact berries were used, but there’s definitely just a berry kick to it. I wanted to ask the shopkeeper about it, but I’d guess the ingredients are proprietary to the shop anyway. It seems like there’s some blueberry, as well as Islandberry. It’s definitely sweet, but doesn’t overwhelm you with it, like a Strawberry Milkshake from the Fresh Foods shop would. 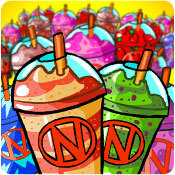 I think a similar product to this is the Neopian Berry Smoothie, which omits the pomegranate (and the cool name). I asked my Gelert, HarborDay to try it. After much coaxing, he took a sip, and told me it was too sweet and colorful. He refused to drink anymore, and asked to leave. I promised him the other items would be better. I don’t know if your pet will like this one, maybe it’s just my wraith Gelert. Now that I had just drank a sweet, pretty good tasting smoothie, I thought I would go for one that was, well, probably not as good. I was not familiar with what alfafa or basil tasted like. I had lentils before. That dish was not good. Anyway, I tried this smoothie. The lentil flavor and texture was there, but both of the herbs had overwhelming flavors as well. It wasn’t as bad as I was expecting, but the flavors were way too present, similar to what the description mentions. It’s good, if overwhelming, spicy flavors that don’t really belong in a smoothie is what you’re looking for. It’s healthy to some extent. There’s also a version of this with no alfalfa, the Large Basil Lentil Smoothie. I asked HarborDay to try this one too. He liked the strong flavors, but then asked me if we could go eat some Blumaroo Steak in the Haunted Woods. I don’t think he’ll ever be satisfied with this store. I was happy when I saw this one. Lemon! Ginger! Ginger and lemon are great. They belong together. Like in teas, or smoothies. So I was delighted to try this, and I as I took a sip from the standard, thin, red straw, I was not disappointed. There’s the perfect amount of ginger and lemon. The flavor of ginger is strong, but the lemon subdues it a little, making it a fantastic combination. The cold smoothie format makes it extra enjoyable. I could see myself drinking this during the month of Swimming while relaxing by Kiko Lake. My conclusion is - it’s great. I bought the large version, but there is a regular sized version as well - the Lemon Ginger Smoothie. I bought a couple to take home. HarborDay was apathetic towards it. That’s a good sign, I suppose. Better than the other reactions he had. The flavors in this one are pretty simple and nonthreatening. Maybe that’s why. The last one I’ll be going over this this kale and celery infused smoothie. The name is clever, a good portmanteau. Probably what I should drink since I enjoyed the last one too much. You can see celery chunks inside that haven’t been completely blended, which I was curious about. Why didn’t they blend it all the way? The chunks won’t fit in that thin straw anyway. Anyway, this looked pretty healthy, with all those green vegetables floating around. After I took a sip, I realized it’s what I expected. Boring, bitter vegetables. The celery especially, is too strong, and I dislike the flavor of celery. Drink it before and after a Battledome fight or something. Drink it before training. Maybe if I force myself to drink one of these every day I’ll become much healthier. But the taste could be improved, even if it is certainly better than eating the unblended versions of kale and celery. By the way, there’s both a small and mega sized version of this product, called the Small Kalery Smoothie and Mega Kalery Smoothie respectively. HarborDay also tried it. He was happy it wasn’t sweet, but was mostly happy because this was the last smoothie we were trying for today. He finished his really quickly. I don’t know how his taste buds work, being wraith and all, but he refuses to explain to me. Well, that was an enjoyable experience. I now have a better understanding of what the shop has to offer, and some smoothies are surprisingly good, not just the dull vegetable blends you might’ve been expecting. They’re refreshing, easily accessible beverages in a friendly location. I’d recommend you try some, if you get the chance. Thanks for reading.